Released April 16, 1937 (Feature). 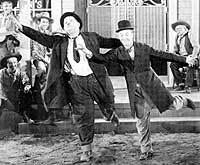 Stan and Ollie arrive in Brushwood Gulch, to deliver the deed to a gold mine to the daughter of an old friend. Fin passes off his girlfriend as the daughter, so the boys giver her the deed. When they realize their mistake, they try everything they can to steal the deed back.